Bob Hope was the first American entertainer to be allowed to tape a special in the Peoples Republic of China, five years after Nixon and Mao had opened China to the west. On June 16, 1979, after a four-hour flight from Narita, Japan, a Chinese Airlines 707 filled with our merry band of mirth makers eager to get their first look at this hotbed of Communism, touched down at the Peking Airport. The group included Bob and Dolores Hope, their daughter, Linda, her co-producer Jim Lipton — with whom Gig Henry and I would share writing credit — Jim’s wife, Kedakai, director Bob Wynn and a support crew made up of pretty much the same gang who had earned their Hope Squadron wings on our trek to Australia the previous year. We started off toward what looked like the main reception area — it had a portrait of Mao over the front door — and after a minute or two spotted a convoy of government limos speeding toward us. Out climbed several officials from the Ministry of Culture who immediately began spewing apologies that would have put Kobe Bryant to shame. Presently there was more bowing than a convention of Sumo wrestlers as they led us into the airport’s reception area. They had a long table set up in the lobby offering refreshments that the crew proceeded to devour while Hope was giving the first of his many interviews on Chinese soil. We were soon convoyed to the twenty-five story Peking Hotel in small vans that carried about six people. (They would be available to us throughout our visit like free taxis.) During the half-hour drive, we got our first look at the hustle and bustle of life in the PRC and noticed few vehicles among the seemingly endless lines of bicycles. Bicycles were the norm — millions of them. The hotel was about six blocks from Tiananmen Square and on the main thoroughfare that leads to the Forbidden City. There, a few years later, a student protester would gain the admiration of the world by making a Chinese Army tank blink first. We were welcomed by the starched hotel staff standing in formation on the front steps. Each smiled and bowed as we passed. This custom would be repeated when we checked out, and again in Shanghai when we checked into the hotel there three weeks later. Gig and I were shown to our rooms on the eighth floor while the Hopes were escorted to the twenty-fifth. Immediately, there was a problem. Dolores’s room was on the same floor as her husband’s, but about fifty yards down the hall. She was told that was the custom among upperclass Chinese. Apparently, our hosts believed that the centuries-old norm for emperors should apply to tourists with emperor status on their home turf. Dolores would have none of it, requesting that her bed be placed in a large anteroom just inside one of the entrances to Hope’s suite where it would remain for her entire stay. The door opened a crack, and Dolores said, “I beg your pardon.” She had come back to her makeshift bedroom-alcove during the two minutes. I said, “You’re supposed to be Don.” She laughed and said, “And I thought you were a good Catholic boy.” She smiled again and added, “Don said he’d meet you for dinner later.” It always helps when your employer is married to a good sport. Dolores and I had a history of mistaken identity. One day, while I was working with Hope at his house, his phone rang. He was across the room and said, “Grab that, will you.” I picked up the receiver and a voice said, “Hello, Bob?” Instinctively, I said, “Yes?” I recognized the voice, but before I could stop her, she said, “Betty Ford called. She wants us to join them for —” “Dolores, it’s me — Bob Mills.” I cut her just short of revealing any state secrets, but we both knew it was a close call. During our visit, we never doubted for a moment that the officials running Chairman Mao-land were serious about their Communist faith. Theirs is a godless society and in 1979, they still meant to keep it that way. This, however, wasn’t about to interfere with Dolores Hope’s devotion to her Catholic faith, the fervor of which made Mother Teresa’s look lukewarm. To call Dolores devoutly Catholic is to call Bill Gates “PC obsessed.” The godless society that can keep her out of church hasn’t been invented. One afternoon, returning from an extended shopping expedition, she announced excitedly that she had managed to put the slip on her interpreter to search for a priest. She not only managed to find one, but he invited her to attend an underground mass the following Sunday. Asked if I wanted to join her (she was aware that I had once studied for the priesthood, but not that I had long since defected), I said, “I think I’m already in enough danger with my jokes.” Hope couldn’t seem to share her excitement, either. “Don’t you know that people here have been shot for that?” he said. “Of course,” she replied confidently. “But at least I’ll die in the state of grace.” Today, there are an estimated three hundred million Christians in China. But back then there were about three, and Dolores managed to find the two Catholics. Dolores traces her roots to Italy (her maiden name was DeFina) and is well known from Toluca Lake to Palm Springs for her considerable culinary skills (she made the salad for their housewarming party there). She had taken no chances when facing a month of nothing but Chinese food. She brought along several large suitcases packed with every non-perishable item she could gather up at Monte Carlo, Burbank’s premier Italian deli which had been “By Appointment to the House of Hope” for decades. Each evening, we feasted on salami, pickles, sesame crackers, mushrooms in olive oil, garbanzo beans and other assorted delicacies that would complement our daily Happy-Hour pitcher of dry-martinis that Dolores would prepare at five o’clock sharp. Shaken, not stirred. Dolores guested on many Hope specials over the years and accompanied him on several overseas trips to entertain the troops. In Hope's waning years, she would often sing her signature song whenever they appeared on stage together, "Don't Go Changin." 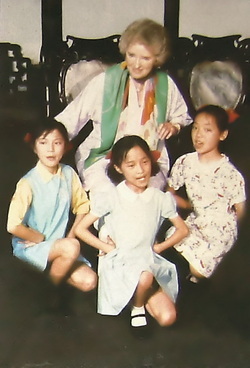 She celebrated her 101st birthday in May 2010.